The Machu Picchu Sanctuary Lodge is just adjacent to the entrance of the Machu Picchu ruins. While all other hotels and lodgings are a bus ride away at AguasCalientes, a town at the foot of Machu Picchu, this is the only hotel that is so close to the site, and hence, it is quite expensive. Despite the steep prices, the hotel is often full, meaning that it is better to book in advance. Dining facilities at the hotel include the Tampu Restaurant Bar and the Tinkuy Buffet Restaurant. Either restaurant offers a selection of international and Peruvian cuisine amidst wonderful views of the grand citadel. The Tinkuy buffet is open for guests of the lodge as well as visitors to the site. The restaurant is huge with a capacity of 200 people and remains busy during the lunch hours as several visitors come here after a tiring walk around the ruins. The buffet lunch is served daily and is open from 11:30 am to 3:00 pm. The cost is steep, about $35 per person, which is far higher than the prices at the town below the site. During the evenings, the Tinkuy Buffet Restaurant shows multimedia presentations about the Machu Picchu Citadel as well as its beautiful orchids. Many tour packages include a lunch at the Tinkuy Buffet. 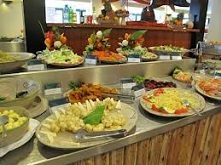 The buffet includes salads, main courses and delightful desserts. Salad items include light and refreshing items, such as pasta salad, caprese salad, spaghetti and meat sauce, roast beef, fish ceviche and beets. The main course offers a sumptuous variety, including ossobucco, roasted potatoes and roasted chicken. Unlimited supply of two exclusive drinks, namely Inca Kola and ChichaMorada, is an added attraction here. Inca Kola is a soft drink made of lemon verbena and has an unusual sweet fruity flavor comparable with liquid bubblegum. ChichaMorada is a Peru-originated sweet beverage made from purple corn. Though the word ‘Chicha’ usually refers to alcoholic beverages, ChichaMorada is non-alcoholic. The price includes soft and hot drinks. The unlimited soda option is particularly useful to quench the thirst after hours of walking around the ruins. The Machu Picchu Sanctuary Lodge has been awarded with the top level certification by the Safe Quality Food Institute. Though the Tinkuy Buffet is definitely a convenient option, it is overpriced. Machu Picchu visitors may take along a lunch packet and water bottle to the site, but they have to leave them at the cloakroom outside the citadel.